Eva trained at Guildhall School of Music & Drama, where she was awarded the prestigious Gold Medal for Drama. 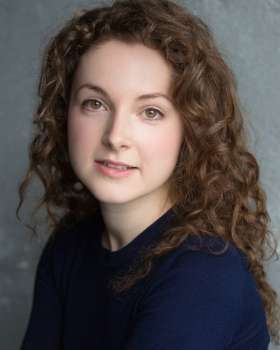 During her training she also won the Michael Bryant Award for verse speaking (National Theatre) and was a finalist in the Carleton Hobbs Radio Competition. Theatre includes: Macbeth (Watermill Theatre), Othello, The Merchant of Venice (RSC), The Winter’s Tale (Crucible Theatre, Sheffield), Eldorado (Arcola), Dorian Gray, A Midsummer Night's Dream (Watermill Theatre),The Dog Beneath the Skin (Jermyn Street Theatre) Northanger Abbey (UK Tour), See What I See (Burton Taylor Studio-Oxford Playhouse), Romeo and Juliet (Shakespeare400 Royal Festival Hall). TV includes: Father Brown (BBC1), Parkinson: Masterclass with Simon Russell-Beale (Sky Arts). Radio includes: Wild Honey, Believe it!, A Small Town Murder (all for BBC Radio 4).